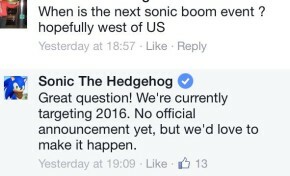 Sonic Boom Event To Return in 2016? If anyone were still in any doubt, odds are there won’t be a Sonic Boom event this year, however, Sega have hinted on their Facebook page that the event may return in 2016 if this post is anything to go by. As of yet there has been no confirmation on a possible Summer of Sonic for 2016, but at least this bit of news seems to confirm that Sega are at least open to the idea of a future event. So anyone interested in going to another Sonic Boom event, let us know in the comments. Finally. It’s good to hear about the status of this event. Woo-hoo! Awesome! Now I hope SoS makes a return in 2016. Good! I had the pleasure of going in 2012 and it was one of the best nights of my life. Bringing the Boom while Boom is going on might be confusing though, wonder if it’ll get a slight name change. For a moment then I thought this was Summer of Sonic in London. But then I heard the Boom. Now I’m sad. Oh I know The Sonic The Hedgehog 25th year anniversary Sega plan it for Sonic Boom 2016 out like you know Sonic The Hedgehog 20th anniversary at Sonic Boom 2011 of Sonic Generations to celibate, so that means we could not getting is Sonic Adventure 3 for 2016 because it the fanbase & series next year how about Sonic & The Wild Jungle story book series on Xbox One Xbox 360 PS3 PS4 & Wii U then 3DS all the consoles is just the fans usually wanted so bad after the last Sonic racing game is Sonic & all Stars Racing Transformed all consoles. So yeah all the fans needed to be all different consoles the new Sonic game Amazon the place where Sonic friends has been tricked by Dr. Eggman again billion times to set Sonic friends on Amazon for a trap but yeah anyway that my ideas for Sonic Boom 2016 if you like my ideas or not? Opps I did it on accident I forgot Nintendo NX for Nintendo next generation console on 2016 for Sonic & The Wild Jungle hopping for a awesome new Sonic game on Nintendo NX for the first time! Sorry, I’m kinda having a hard time reading your run-on sentences here but from what I can see, no, I don’t like the idea of it all being set in one location. Something I love Sonic and all other platformers for is the variety they provide, as far as the visuals and obstacles are concerned, and just being set in one location, in this case the Amazon forest, would remove all that variety and make the overall game a bit dull, in my opinion. It also wouldn’t be a story book game since, unless it was based on The Jungle Book and/or Tarzan, it wouldn’t be based on any story books which is the whole point. Sorry, forgot to add, it also doesn’t make any sense for the characters to… am I reading this correctly?… be… tricked a billion times? I mean, Sonic and Tails have never been tricked by anyone in the games (SPOILER: aside from Merlina).